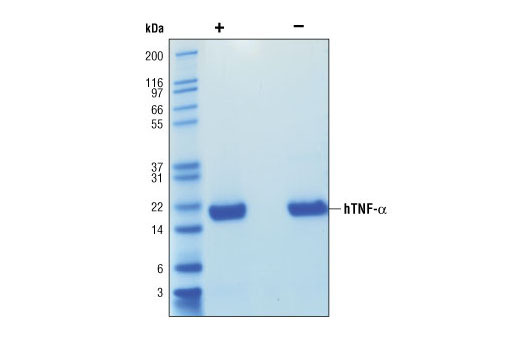 The purity of recombinant hTNF-α was determined by SDS-PAGE of 6 µg reduced (+) and non-reduced (-) recombinant hTNF-α and staining overnight with Coomassie Blue. The viability of L-929 cells treated with increasing amounts of hTNF-α in the presence of 2 ng/ml actinomycin D was determined. Cells were stained with crystal violet at the end of treatment and the OD595 was determined. 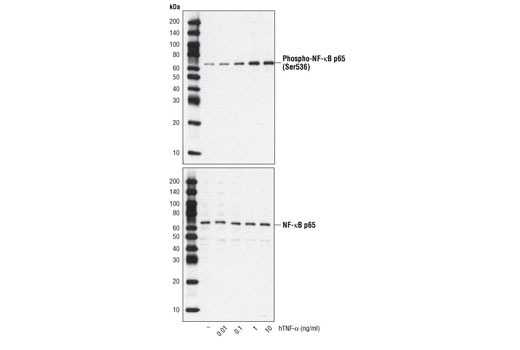 Western blot analysis of extracts from HeLa cells treated with hTNF-α for 20 minutes, using Phospho-NF-κB p65 (Ser536) (93H1) Rabbit mAb #3033 (upper) and total NF-κB p65 Antibody #3034 (lower). Recombinant human TNF-α (hTNF-α) Val77-Leu233 (Accession #HUMTNFAB) was produced in E. coli at Cell Signaling Technology. >98% as determined by SDS-PAGE of 6 μg reduced (+) and non-reduced (-) recombinant hTNF-α. All lots are greater than 98% pure. Recombinant hTNF-α does not have a Met on the amino terminus and has a calculated MW of 17,352. DTT-reduced and non-reduced protein migrate as 18 kDa polypeptides. The expected amino-terminal VRSSS of recombinant hTNF-α was verified by amino acid sequencing. 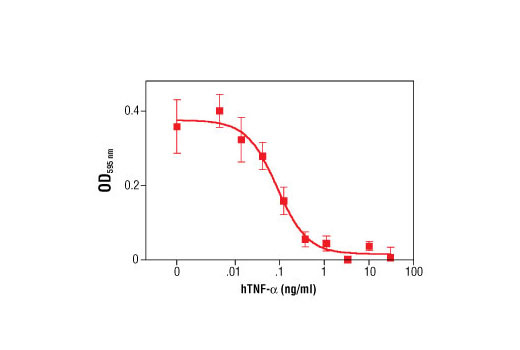 TNF-α is a non-disulfide-linked homotrimer in solution as determined by chemical cross-linking. The bioactivity of hTNF-α was determined in an L-929 cell viability assay. The ED50 of each lot is between 10-500 pg/ml. Less than 0.01 ng endotoxin/1 μg hTNF-α. With carrier: Lyophilized from a 0.22 μm filtered solution of PBS, pH 7.2 containing 20 μg BSA per 1 μg hTNF-α. Carrier free: Lyophilized from a 0.22 μm filtered solution of PBS, pH 7.2. TNF-α, the prototypical member of the TNF protein superfamily, is a homotrimeric type-II membrane protein (1,2). Membrane bound TNF-α is cleaved by the metalloprotease TACE/ADAM17 to generate a soluble homotrimer (2). Both membrane and soluble forms of TNF-α are biologically active. TNF-α is produced by a variety of immune cells including T cells, B cells, NK cells and macrophages (1). Cellular response to TNF-α is mediated through interaction with receptors TNF-R1 and TNF-R2 and results in activation of pathways that favor both cell survival and apoptosis depending on the cell type and biological context. Activation of kinase pathways (including JNK, ERK (p44/42), p38 MAPK and NF-κB) promotes the survival of cells, while TNF-α mediated activation of caspase-8 leads to programmed cell death (1,2). TNF-α plays a key regulatory role in inflammation and host defense against bacterial infection, notably Mycobacterium tuberculosis (3). The role of TNF-α in autoimmunity is underscored by blocking TNF-α action to treat rheumatoid arthritis and Crohn’s disease (1,2,4). Brennan, F.M. and McInnes, I.B. (2008) J Clin Invest 118, 3537-45. Ren, H.Y. et al. (2015) Oncotarget 6, 4080-96. Brusgard, J.L. et al. (2015) Oncotarget 6, 28132-50. Cao, Y. et al. (2014) Cancer Res 74, 5091-102. Ma, L. et al. (2015) Chin Med J (Engl) 128, 2658-63. Fischer, A. et al. (2013) Am J Physiol Gastrointest Liver Physiol 304, G970-9.